I just want to start out saying that I HATE that I can now write this article from first-hand experience. My wish is still to be living in ignorance of the importance of a will, or even what probate court is, but I'm not. I used to think making a will was just plain morbid, and almost a jinx. The thought of either of my husband or I passing was so painful, that I pushed the thought away and ignored the need for a will. Some weird part of my brain thought that if we wrote it, then something would happen to one of us. In hindsight, I see it was as logical as thinking if you avoid the doctor, then you can't get cancer. But it is how I felt. We know now it is a final act of stewardship and love. God has given us earthly possessions, and we need to be stewards of them, even after we pass. God has given us people in our lives, for good or bad, who will need to deal with our possessions when we have gone ahead to Heaven. We lost my brother-in-law to a freak accident in November 2017. He was in perfect health, only 36 years old, with a fiance and four minor children. He had zero reason to think he would be going to Heaven any time soon. Thankfully, we know that is exactly where he went, to his Heavenly Father. That knowledge is the only way we survive the grief. But that knowledge did not make the logistics of his passing easier. He was a wonderful provider in life and death, and we were able to find a very generous life insurance policy he left for his children. He was passionate about life insurance, and even sold us our life insurance policy, but even though we able to easily locate his life insurance policies among his papers, we were never able to find a will. I asked my family if I could share this information, and our sincere wish in sharing our experience is to help in anyone's future grieving process. Your loved ones will need time to grieve you. The more decisions that have to be made, the less time they can focus the grief process in a healthy way. 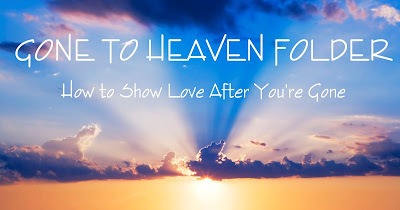 After my brother-in-law's passing, my father-in-law shared that they have a "Gone to Heaven" folder. It includes more than just his will; it takes all the decisions out of your loved ones grief process. His church urges the men in of the congregation to do this, and I am so thankful for that push towards stewardship and love. They tell you there are a lot of decisions after someone passes, but I had no idea how many. I thought once you arrange the funeral, (which itself takes several emotionally exhaustive days), you are done. But no, that is only the beginning. 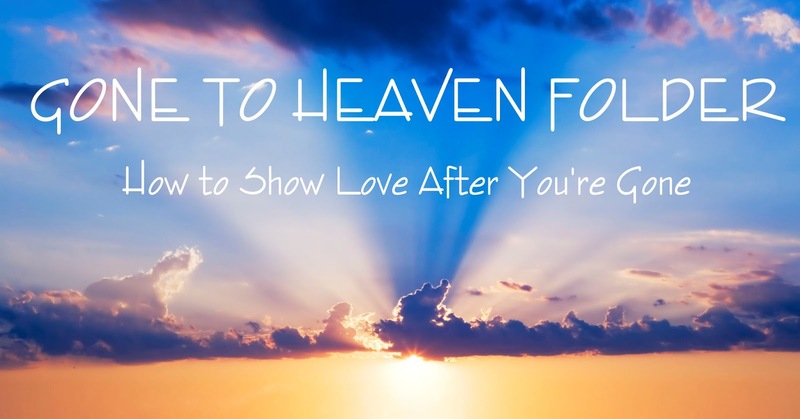 Think of your Gone to Heaven Folder as a way to show love to the ones left behind, to take care of them even when you aren't there to do it yourself. Of course, we know my brother loved us while he was here. This past year he affirmed that more than any other time, ironically we had never all been closer than in the 10 months before he passed, but the logistics after his passing made the grieving process difficult. It will take some time to put your will together, but it will be a TINY fraction off the time your loved will have to take after your departure. Do not wait. A scribbled napkin with your wishes is not legal. In Indiana, You need a document that is signed in front of at least two witnesses (check your states laws), preferably in front of a notary. Better to have it signed in front of a notary, because without notary, those witnesses will be called into court to testify they saw you sign it (and court is not free). It does not matter if you are happily married or engaged with a wedding date planned, NEVER assume what happens to your estate. I am not a lawyer, just sharing the tidbits we've learned through this process. Orally expressing your wishes is not legal. It does not matter that you told a loved one your wishes! We knew my brother's wishes, but we didn't have it specifically in writing. Each member of our family, and his fiance, had had a conversation in the past few months with our brother about who he wanted, and more specifically who he didn't want, involved with his business and even allowed in his house, but legally, it is all hear-say. Change your will whenever you have a big life changes; like a divorce, engagement, or estrangement. As a wedding photographer, I saw for a decade how weddings bring out the BEST and WORST in people. I have recently learned funerals do the same. It is understandable, grief distorts our perspectives, but let's face it, there are just people in the world, who will exploit even a death. No legal will equals the government getting involved. In Indiana, our state, if you die without a will, your estate will most likely go to probate . Probate means the government WILL get a chunk of your estate, in the name of helping settle who is executor of the estate. They will most likely name your spouse as executor, but not before they take a chunk out in lawyer fees and court costs. The last resort is probate. Worst case scenario, the last thing your family needs is a lawyer being involved by someone filing for rights to an estate in probate before you even finish funeral arrangements or bury your loved one (yep, that happened to us...even the lawyers were shocked and had never before seen anyone file before the burial). Probate will take a chunk of the estate, no matter who is appointed executor. Probate court doesn't care about the deceased wishes, it cares about what costs the estate the least amount of money. Probate won't make sure money gets put into trusts for kids, or is managed according to the deceased wishes. Probate court makes sure creditors paid, period. Hire a lawyer. It will take an experienced lawyer maybe an hour or two to draw up a will for you. The ONE BILLABLE HOUR you pay will be so much less than the COUNTLESS BILLABLE HOURS & COURT COSTS your loved ones will have to pay after your passing. Use online legal service. My husband and I used Legal Zoom, and were very satisfied with the result. You will still need to get it notarized and signed with witnesses. Write your own using online template (make sure it is legal according to your state) You need a document that is signed in front of two witnesses. Better to have it signed in front of a notary, because without notary, those witnesses will be called into court to testify they saw you sign it (and court is not free). THE WILL IS THE MOST IMPORTANT! Do that now. There is no one whose job it is after a death to track down all the the accounts that need to be managed or paid (no one who does it for free at least). Death Certificates do not arrive the day of death, so do not assume loved ones will be given access to your accounts or phone immediately. Many times, it takes several weeks for death certificates to be mailed. You of course are keeping this in a secure location, that is known to your trusted loved ones. List of monthly bills and how you pay them (do you pay online, where do you keep your files, is your mortgage taken out automatically, etc). This of course will change more often than other items, but will give your loved ones a good place to start. Side note-If you have a "role" in your family, make sure others know how to do it. My husband and I sat down last week and he showed me how to pay the monthly bills. Once you are done, this section is where you add your favorite quotes, song, poem, picture for obituary, etc. We learned how hard this planning process was. It takes several days; no bills get paid, no texts get returned. You get stuck on on their obituary wording, and every other little detail that reminds you they are gone. Some of the planning was cathartic, but so much of it just kept reminding us we were not in a dream. My husband and I personally haven't finished this section, but I have started it at least. I asked for the song I sang when I decided to give my life to Jesus, "I Surrender All". Also included a few of my favorite quotes from Jane Austen and C.S. Lewis. My father-in-law has already written his obituary. While it may seem morbid to you, it is a huge relief to me to know his voice will still be present after he departs for Heaven. I haven't finished this yet. And that is OK. I know my family will not have to deal with the logistics of my passing, and they will be able to focus on the many ways I show them I love them already. This is the hardest part, and honestly the least important logistically. If this step is too emotionally hard for you, and delays you from putting together this folder, please skip it for now. You can always come back to it, but the other logistical items will show love to those left behind by helping them not question their decisions.